How to change leather jacket yourself? Leather products are very practical and durable. They can be passed on from the older generation to the younger, the only trouble is that the skin has the property of rubbing and getting out of fashion. If you want to breathe new life into your beloved or your parents, you can change the leather jacket, and do it yourself. To do this, you will need a minimum of assistantsMeans, most importantly - to have a pattern of the desired product. With sufficient skills of cutting and sewing, you can do it yourself, if there are not any - go to the atelier. Carry out a pattern. Outline all the details of the leather product, simulating them according to your shape. Now it's time to rip off the old jacket. Use a scalpel or razor to cut the joints. Well, if you have to put a leather cloak in the jacket - then the details of the pattern will be freely placed on the material and the seams can not be touched at all. Otherwise, if you have not a cloak, but smaller outerwear, they need to be spread out well, and if they are glued, iron it through the gauze cloth, but only on the wrong side. Now it is necessary to equip the rollerOr with a Teflon foot, install a thick triangular needle and proceed to grinding the parts at home. 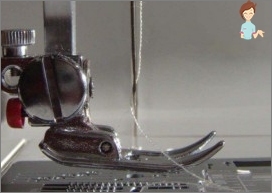 The stitch is best set to 3 mm to prevent excessive perforation of the material. The seams of a leather product must be taped with a wooden hammer. Try to make machine stitches neatly. Now you can turn the product on the wrong side and iron it. Using glue to connect the edges of the allowances, wait until it dries. Sew a collar, stitch up your sleeves, sew your own zipper. Fold and glue the bottom, leaving the top of the fold free. Stitch the parts of the lining and connect it to the base. Sew up the bottom and sleeves. How can I change leather jacket, you already know,But how to return the material to its former splendor and beauty? If you have visible defects - scrapes, cuts and others, then the product can be painted with a special paint. Another way - zadekorirovat damaged area or restore it with liquid skin. Very stylish and modern-looking combination of leather with cashmere, suede, drape and other fabrics. Such an approach is advisable in the event that the old thing has the same size as the one that is planned to be obtained as a result. The presence of defects complicates the process. Therefore, the details cut out of another material, can not only solve the problem, but will also become an adornment of the new jacket, its zest. As a result of the alteration, you can change the skin color by selecting a shade in the tone of the fabric, or you can, on the contrary, play in contrast. It all depends on your imagination. Good luck!